Students use a small motor and simple materials to create a line-drawing robot and experiment with how to change the way the lines are drawn. Later they use contrast and a variety of materials to create a body with robot characteristics. Remove some of the plastic coating from the ends of the wires on the 2AA battery holder. Join the wires to the loops on the motor. Turn the battery switch on to test if it works. Choose several colours of marker. 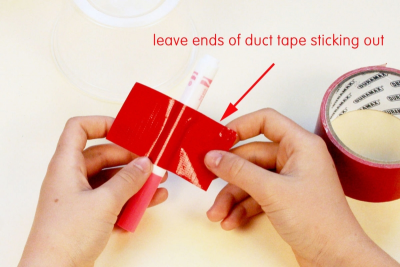 Place a piece of duct tape on one of the markers with the ends of the tape sticking out. Place the marker with the tip facing down and at a slight angle. Tape it to the plastic container. 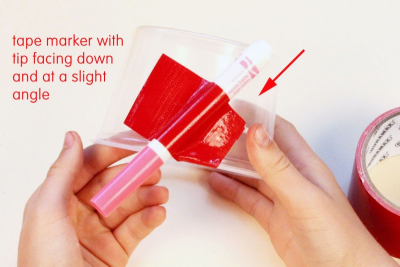 Tape 4 or 5 markers around the outer edge of the plastic container. Make sure the tips all touch the table surface when the container is placed upright. Tape the 2AA battery holder to the side of the plastic container. Tape the motor to the top edge of the plastic container. Make sure the shaft of the motor hangs over the edge of the container. Push a cork, off centre, onto the shaft of the motor. Make sure it is good and secure. Place the craybot on top of a large piece of paper. Experiment with where you place the cork on the shaft to see how that changes the kinds of lines the craybot makes. 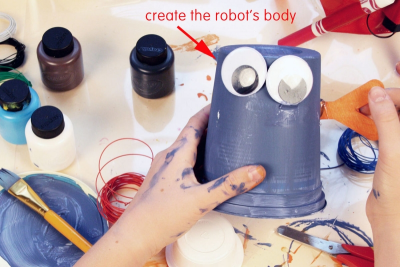 Use other containers and acrylic paint to create a body for the craybot. Attach the body to the base. Experiment with other materials and designs to create different patterns by changing how the robot moves, for example, how can they make something that will roll or hop while making marks. Collaborate to innovate and delve deeper into making other kinds of robots based on what they have learned. Share their designs with the class and discuss their processes. Gather a variety of empty plastic containers and or tins. Gather, and make available, books about robots, for example, The Robot Book: Build & Control 20 Electric Gizmos, Moving Machines, and Hacked Toys, by Bobby Mercer; Robotics: Discover the Science and Technology of the Future with 20 Projects (Build It Yourself), by Kathy Ceceri, and Sam Carbaugh; Making Simple Robots: Exploring Cutting-Edge Robotics with Everyday Stuff, by Kathy Ceceri; Making Things Move DIY Mechanisms for Inventors, Hobbyists, and Artists (Electronics), by Dustyn Roberts; and Making Simple Automata, by Robert Race. Prepare a sample of the working mechanism of the craybot for demonstration purposes. Ask students what they know about robots. View and discuss an image of robots in industry. Ask students to think about why robots are important and how they are changing how we do things. Display several images of robots in art alongside each other. Ask students to look at the works closely for a minute. Share first impressions of the images. Ask students to compare the images. - How are they the same? - How are they different? Ask students to think about what characteristics they would include if they were designing a robot. 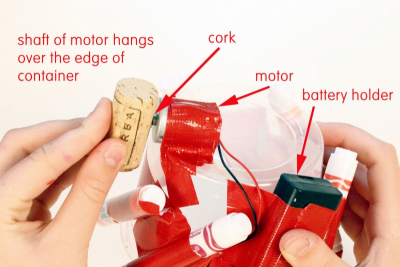 Demonstrate how the craybot works, pointing out the motor, battery pack and cork. Discuss the way the cork causes the motor to be unbalanced, and the effect this has on how the robot moves. 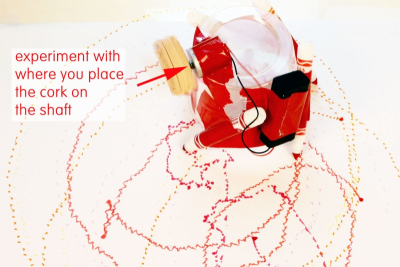 Create a motorized robot that draws a variety of lines. 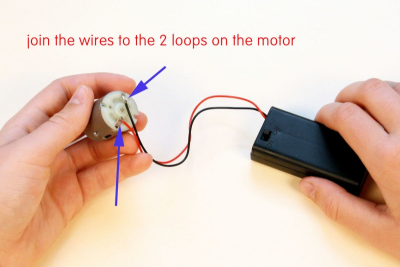 Correctly wire a small motor to a battery pack. Use contrast and a variety of materials to create a body with robot characteristics. 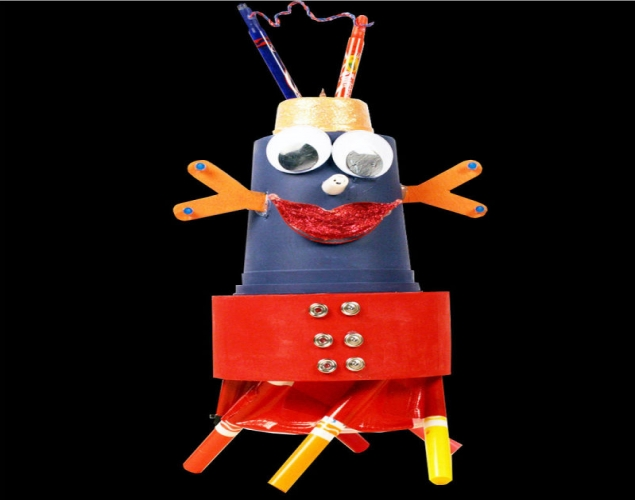 Encourage students to add their own personal touch to their robot. - Share their work and discuss the things that are especially effective and why. - Talk about what they found satisfying about doing this project. - Talk about what they found challenging about doing this project and how they solved their problems. - Talk about how they might use what they learned in a different way. 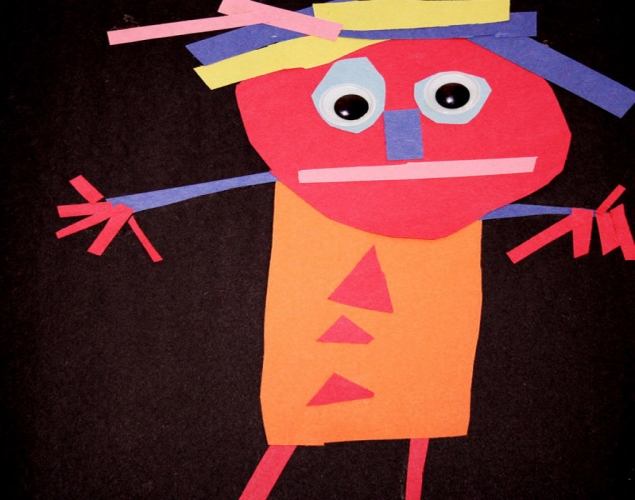 Observe students as they discuss the robots – active listening, insightful contributions, supporting ideas with evidence found in the artwork and from personal experience.